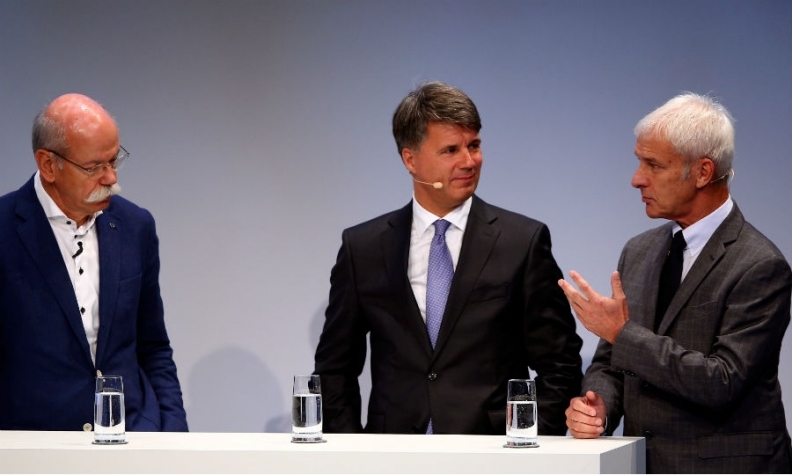 Daimler CEO Dieter Zetsche, left, with BMW CEO Harald Krueger, center, and VW Group chief Matthias Mueller at the 2016 Handelsblatt auto summit. WASHINGTON -- U.S. Justice Department officials are looking into allegations that German automakers colluded on technology, strategy and parts to gain an advantage over rivals, according to a person familiar with the matter, though there’s no indication that the department has opened a formal investigation. The European Commission and Germany’s cartel office said Saturday they have received information about possible collusion and are studying the matter. That acknowledgment came after Der Spiegel reported last week that the biggest German car manufacturers -- Daimler, BMW and Volkswagen Group, which includes the VW, Audi and Porsche brands -- may have colluded for decades. According to the Spiegel report, the five German car brands met starting in the 1990s to coordinate activities related to their vehicle technology, costs, suppliers and strategy as well as emissions controls in diesel engines. The discussions involved more than 200 employees in 60 working groups in areas including auto development, gasoline and diesel motors, brakes and transmissions. Talks may have also involved the size of tanks for AdBlue fluid for diesel autos, which is at the heart of the emissions-cheating case in which VW pleaded guilty earlier this year, the magazine reported. The Spiegel article said that one aim of the collusion was to obstruct competition, with the carmakers agreeing on costs for components and technical details such as convertible roofs. BMW on Sunday denied it had colluded with other carmakers in connection with allegations of cheating diesel-emissions regulations. Kenn Sparks, a BMW spokesman, declined to comment on the Justice Department’s review. VW declined to comment. The company earlier said the Spiegel article contained "speculation and conjecture." Han Tjan, a spokesman for Daimler, said the company doesn’t comment on speculation. Mark Abueg, a Justice Department spokesman, declined to comment. A collusion probe could be another issue for the carmakers to deal with after investigations into the use of software on diesel vehicles to cheat U.S. emissions tests. VW pleaded guilty in March in that probe, which cost the automaker more than $24 billion in government penalties and owner restitution. Daimler remains under investigation, people familiar with the matter have said. VW’s plea agreement with the government requires that the carmaker commit no other crimes and cooperate with any U.S. investigation related to the emissions of its vehicles. Any investigation into possible collusion would be handled by the criminal section of the Justice Department’s antitrust division, which is separate from the environmental and criminal divisions that handled the emissions-cheating case. The German cartel office, known as Bundeskartellamt, said in a statement Friday that it had searched the car companies last year as part of a probe into a possible steel cartel. It didn’t elaborate on a possible follow-up probe on car technology, saying it doesn’t comment on ongoing investigations.